What does one do with an unexpected tax return??? Why, buy a new doll of course!! I haven't had much time to take decent shots or even to have a good play yet- but will post more soon! She is utterly adorable, and I love her best in her cute red wig!! I like brown wig on her. She's very pretty. Cant wait to see more shots. Thank you Solveig- I promise more photos soon- although the light here is not great at the moment!! Now everyone- she was always going to be Bella, but the more I look at her, the more she looks like Demelza in the new Poldark series, and I have always loved this name being a Cornish lass myself (Well the British half anyway the rest is Italian lol!!)!! What do you all think?- Bella or Demelza? Very beautiful and delicate. Congrats on your new doll! 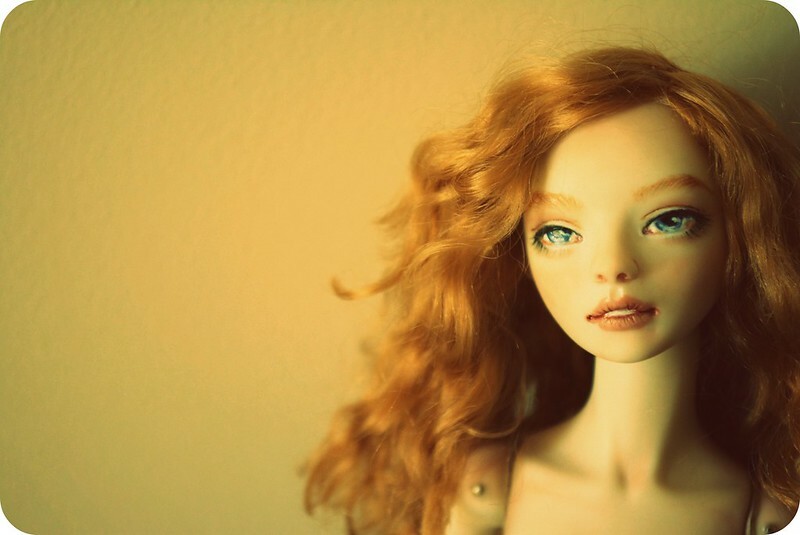 Congratualtions on your new doll - she's lovely! - and thank you for posting the photos. Was the stand included too? Have you planned some clothes for her yet? Thank you kamia and fawkes! Yes, the stand was included too, and I really like it as it has a metal base which makes it heavy, and Angelika has covered it in a kind of moleskin, so the feet don't slip around at all. I have millions of plans for all my dolls lol! At the moment I am in corset mode!! 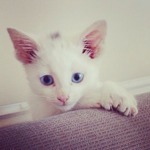 Hi Beau yes- it may end up being Demelza, although I keep changing my mind lol!! And yes, I was born in Cornwall, then lived in several different places including Bristol and London, and now I am living back in Cornwall! You are right- it is beautiful here!! Oh I love her! Was she a custom, secondhand...? She is so pretty in every wig! Huge congratulations on her arrival. She is absolutely stunning. I love this sculpt, she is adorable. Allurose, the photos are really bad because the light was terrible when I was taking them, but she is actually forget-me-not, one of Angelika's latest dolls, and I bought it direct from her. Angelika as far as I know wont do 'custom' orders- you can just order the versions of dolls she has on her flickr site, but she limits each doll to 20 copies. Mine is 15/20 so there must be more out there! And perhaps she is already working on her next doll!! I am really impressed with the quality. I confess I wasn't a great fan of her earlier versions as I found the paintwork to look a little heavy for my taste, and I didn't like the hip joints, but this new revised body is pretty much perfect, and her painting skills have much improved. Needless to say I am very very pleased! She's very pretty!I like her with braun wig.Congrat! 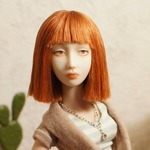 I looked her Flickr page,she make very beautiful dolls!